We had a really good garden this year, which supplied us with an over abundance of abundance of peas, beans, carrots, peppers, corn, cabbage, tomatoes, watermelon, cantaloupe, pumpkins, squash, cucumbers, and beets. 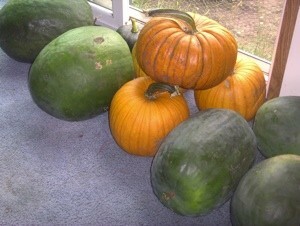 Here is a picture of of the lovely pumpkins and big watermelons we grew! What a nice picture! I just saw that you are also in Topeka. My melons didn't look that yummy! I love the pumpkins too, great photo!